I was swayed by lots of enablers at the SSK retreat. But they could have just pushed me with a feather and I would have fallen into this rabbit hole. It’s portable. You can do it just about anywhere. It’s not a big investment in equipment. You are using different muscles than knitting and sewing. Imagine getting exactly what you want to knit. On a whim, I had already signed up for Malia‘s Find the Spindle that Sings class. She was a great teacher. I should have signed up for the beginning spindle class. Because, like the first Photoshop class I took where I didn’t even know how to turn on the Mac, I didn’t know how to start. But I caught up quickly with the more experienced spinners. She went through techniques and other things that are variables in the qualities of the finished yarn, before going over all the different types of spindles. 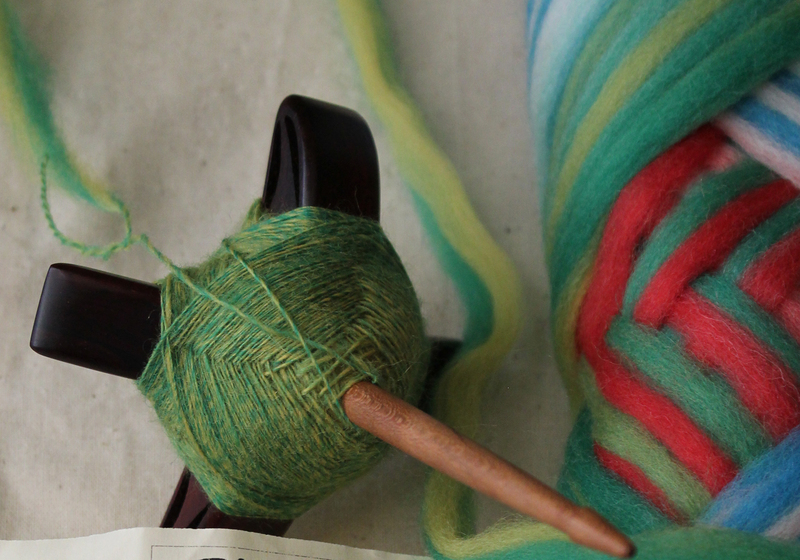 We had an opportunity to test out all the spindles she demonstrated and different types of fiber. I fell in love with 3. Kate’s Cauldron (simple top spindle), Forrester ( Star Trek looking top spindle) and a turkish. By the end of the class, I felt like it really was the right class for me. I decided to get a spindle at the market, a Jeri Brock turkish spindle. But also decided NOT to get any fiber. I have a little at home that was given to me. If I finish what I have, than I’ll make the commitment to go further. You see, my original idea for the spindle class…I wanted to figure out how a quick and easy way to ply all the thrift shop sweaters I already have. You see, I was in sticker shock when I started knitting and thought, how cool would it be to knit with a $2 merino/silk men’s sweater. I didn’t realize how thin and weak the yarn is. Malia said that commercial sweaters are single ply with very little twist, all the strength and structure is in the knitting machines. We can’t knit as finely as the machines. I would agree. I have a lot of work/fun ahead. But I need to do more research on finishing the yarn. The spinning is slow, but I’m getting a decently even thickness in the single. This is strictly for fun. I don’t like the first plying attempt. It is too loose. I was hoping for some advise at the last knitting guild meeting. No such luck. I may have to start watching more spinning podcasts and checking on more YouTube videos. This entry was posted in Spinning - No Needles, Zigzagging and tagged Spinning, turkish spindle on July 29, 2014 by slantedstitches. Of course it’s not perfect. Is any bag perfect? Yeah, It’s done. And I like it. I love the fabric mix. I love the inside pockets. Check marks all my wish list. The lining fabric wasn’t stiff enough to stand up. I had to add boning at the sides. My stitching wasn’t perfect. The faux leather kept stretching which caused some puckering. Still more to learn. Fortunately, it’s not on the public side. I have a new roller foot that should eliminate this as a problem. One design flaw that is bugging me, that can’t be fixed…yet. The inside curve of the bottom is bulging out. I wanted the inside curve to fit around the hip for comfort and to sit on a table without toppling over. This will take some thinking. I wish I had time to make a matching wallet. Maybe next week. Am I always thinking about the NEXT project. Yep, I think the next bag will be a slouchy style. 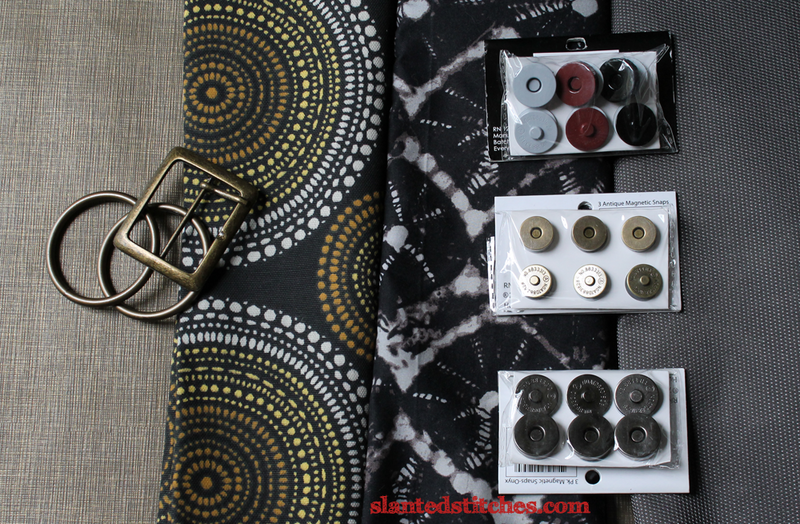 This entry was posted in Sewing and tagged faux leather, linen, making, process, purse design, upcycle on July 17, 2014 by slantedstitches. One of the things I have learned the hard way…This is the “fail as fast as you can” stage. It’s better to discover what you don’t want or what doesn’t work at this stage with paper models. 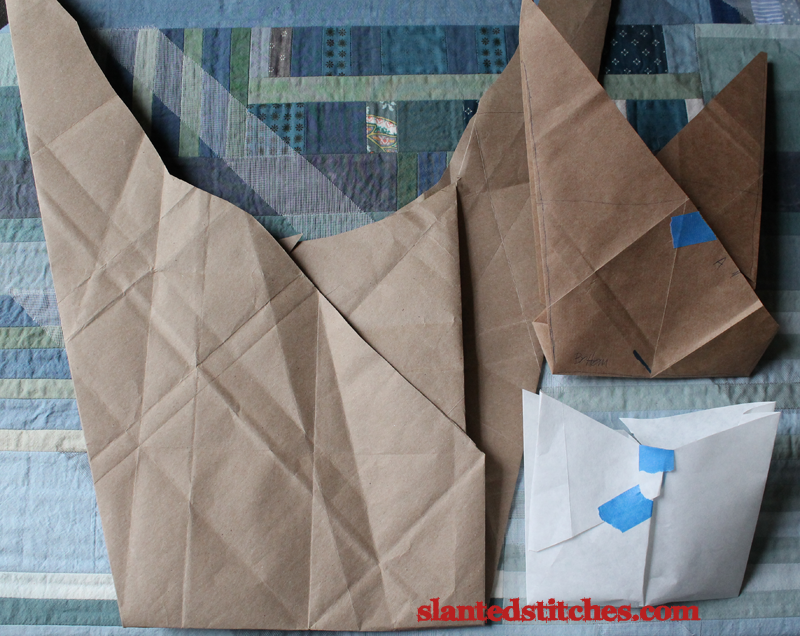 Two of the small models looked promising, so I was ready to make the equivalent of a muslin pattern. Instead, I made a better decision to expand the model to full size using brown paper grocery bags. (shortcut thinking: I can always use this as the pattern for cutting.) One of the model designs was eliminated based on being too bulky in the full size model. I throw all these rejects and notes in a bin to revisit at another time. Time to focus on additional favorite features (accommodating all the stuff I want to carry in this bag). Minor adjustments needed for the pockets. Time to make a working model in denim. Although not all the kinks are worked out. I’m in a rush, so decided to improvise on the final bag. Unfortunately, I forgot a few little features and to also work out ALL the processes, specifically, finishing the tabs. But I don’t know if this would have changed with less time pressure. Time to pick the final fabrics. This is the fun and most time consuming part. So many possibilities, so many potential mistakes. I was happy with the first choice (black faux leather, black indoor outdoor fabric, nylon lining, and black micro suede. But decided it was too safe and too dark. Better to find something that was more summery. 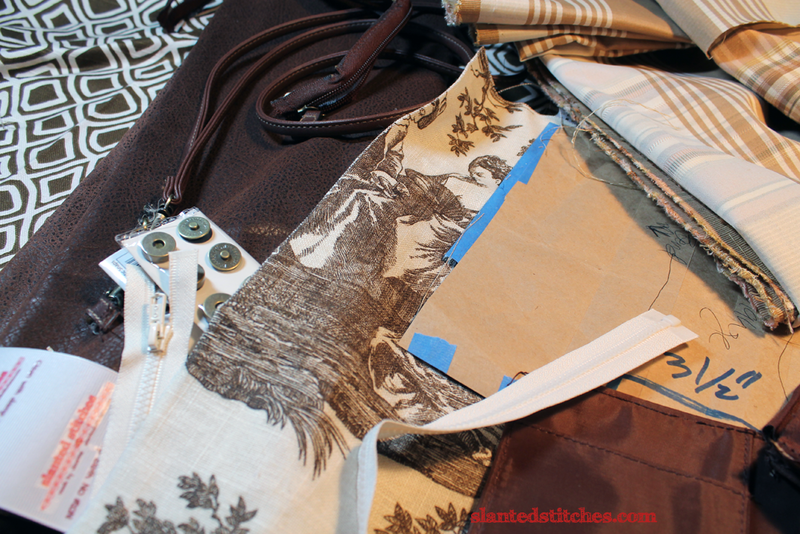 Started with a favorite decorator linen toile, matched with a primitive pattern, another dark chocolate-brown faux leather, upcycling hardware from an old bag. 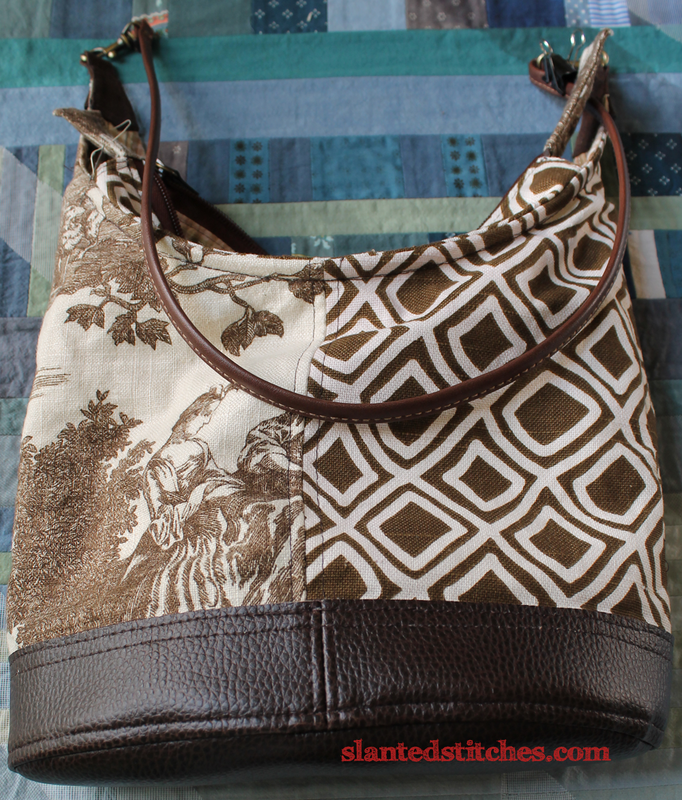 This entry was posted in Sewing and tagged making, process, purse design, sewing on July 16, 2014 by slantedstitches. Panic: I Need A New Purse! 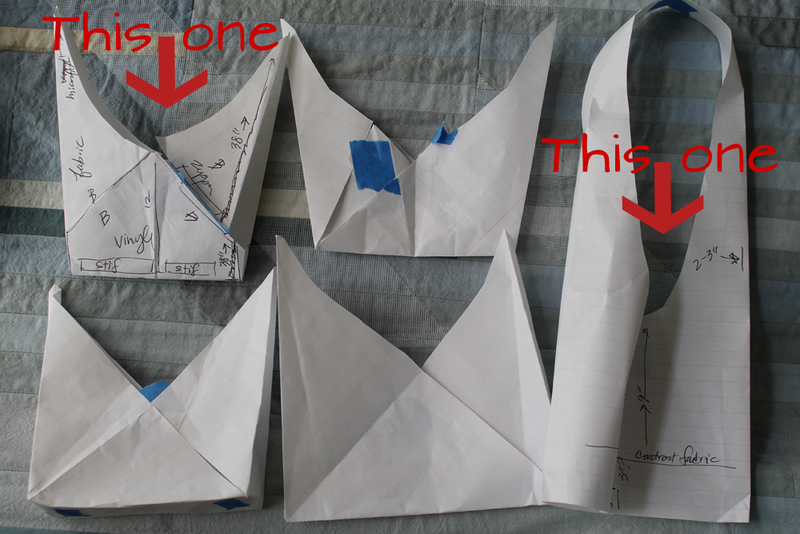 Since this is a blog about the crafting process, I thought I should include you in the beginning stages. But I am in a rush. The editing will not be perfect. This whole sewing project started several years before I learned to knit. I bought some wonderful faux leathers in olive green ostrich, sparkly silver, and slightly practical creamy yellow. Just like yarn stash, they have been marinating until I felt brave enough to cut into them. Unlike yarn, once you make that first cut. There is no frogging. There is no do-overs. In other words, there is hesitation and fear. Since I started making the knitting project bags, I’ve been cutting and sewing lots of faux leather and other great fabrics. I have overcome my fear of the faux. But of course, I still needed an outside catalyst (a kick in the pants) to do something about it. The catalyst: opening the Etsy shop and going to SSK in less than two weeks! I love my knitting project bags. They are colorful and fun and a little sophisticated. My own personal purse is BORING. It is a very practical early black Baggalini cross body. I need to show up with something more interesting. I need to add a bit of fun. Hence the panic. That is the very beginning for my design process. I need to solve a few problems/criteria. A. I need something with more style and color than basic black. B. I need to finish it in 10 days. C. It should still be in the ‘Calm’ and neutrals, so still on the practical side. D. Cross body and/ or backpack style. Oops, that’s a long list. Step one: Research. I’m not a shopper. Going around to the stores is not my idea of fun. So glad we have Pinterest now. I searched on cross body bags. Found too many. 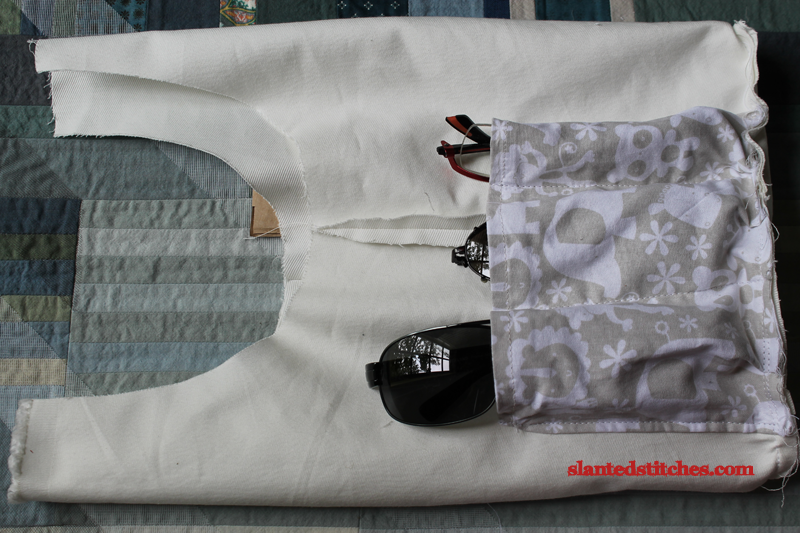 Changed search to cross body bag tutorials. Found enough to be interesting. Step two: Model construction. I start with binder paper. Nothing fancy. I just need to understand basic construction and possible tweaking. 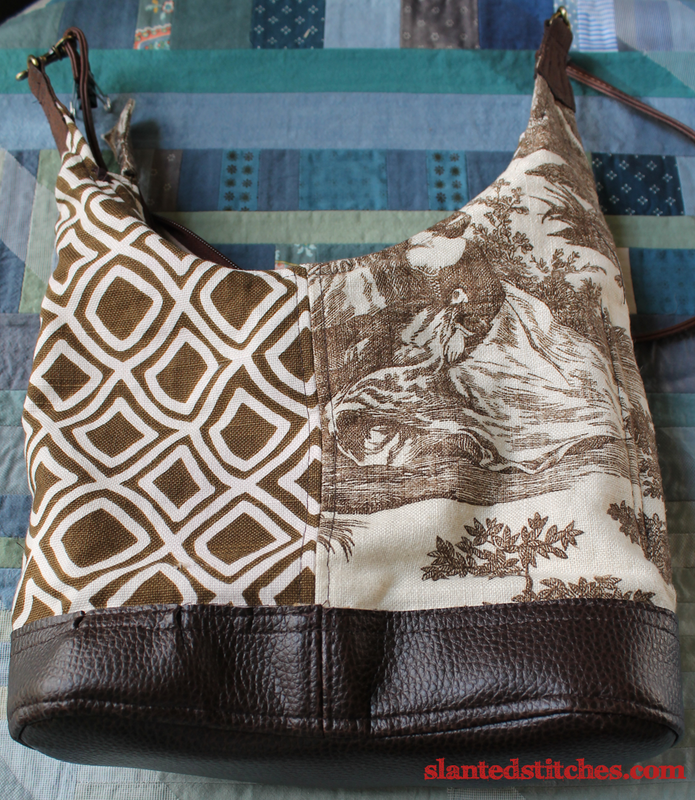 This entry was posted in Sewing and tagged making, purse design, sewing on July 7, 2014 by slantedstitches. As I mentioned in previous posts, I’m not a chatty person. If you and I have a chance to meet and if you ask, I will freely chat about crafting, food, and faith. I’m much more interested in finding out about you. As we are chatting and you tell me you have a child or grandchild in high school or in college or you are about to retire, just retired, or in career transition, I WILL tell you about Johnson O’Connor. SInce nearly everyone is the last one, in career transition, I’ve been very chatty these last few years. Most of the time, I get blank stares until I share a few of the stories. No one “gets it” until I do tell a few stories. First of all, Johnson O’Connor Research Foundation (JOCRF) is not your fairy godmother or fortune-teller magically plopping you into your ideal career path. Instead, I got an honest look at who I am, warts and all. If you are not ready to see your warts as an asset than wait until you can. It took me quite a while to figure out how to use the information I learned. Even so, I wish I had this information 20-30 years earlier. As an engineer, Johnson O’Connor was charged with researching ways to improve productivity at General Electric around 1922. He theorized this could be accomplished by pairing individuals’ natural aptitudes with appropriate jobs. The program was successful. So successful, the workers wanted their children to be evaluated to help in their education and later jobs. As the organization grew, the focus switched from corporate productivity to the individual’s job satisfaction, with testing offices in several major cities around the country. The website and Facebook pages have more on the history, and other’s stories. GO there for all current information. The best time is to go BEFORE you plan a major career change or you are unhappy in your current situation. You may not need to make a big life change to find satisfaction. You might only need to channel a missed aptitude outside of work. By the way, I do not have any financial relationship with JOCRF. And all the following posts are drawn from personal experience of mine, family and friends. I don’t always have 20-30 minutes to chat with folks, like at the cash register, about this. Now I can say, read my website/blog to find out more. This entry was posted in Zigzagging and tagged aptitude testing, career transition, Johnson O'Connor on July 1, 2014 by slantedstitches.